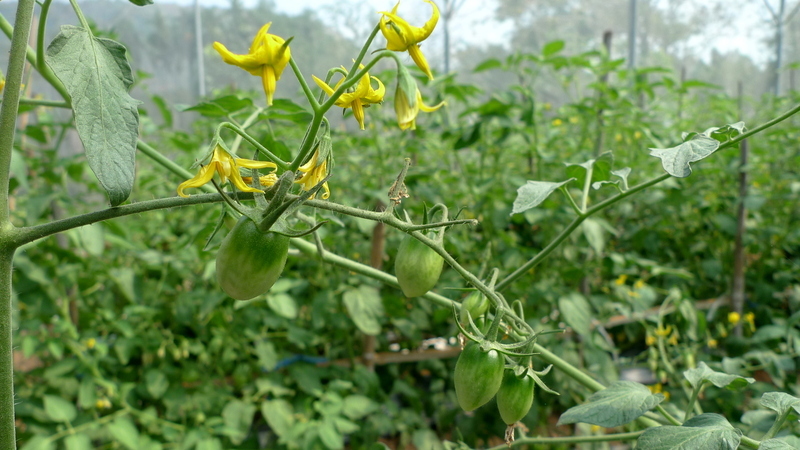 A chance meeting with an American expat whose family is in the seed business leads to a behind-the-scenes tour of an organic vegetable farm in Korat province. When I moved to Thailand a bit more than six years ago, organic produce was a rare sight. The more western-oriented supermarkets would have small sections – one or two shelves in a single refrigerated display case – featuring lonely looking organic vegetables, often flown in from foreign shores. Today when I visit the produce section of the market, the organic selection makes up as much as about one-tenth of the available real estate. Many of the organic items are grown in Thailand, although imports are still present. The range of organic produce is wider, too: apples to arugula, okra to onions. I am pleased that organic produce is gaining traction in the Thai market. I am also confused, though, at the number of “near” or “faux” organic products being sold. With labels like “pesticide safe”, “hygienic”, and “INSERT LABEL HERE” and no clear oversight and regulation, I am never sure just what I can safely eat. Curious and confused, I took advantage of my recent introduction to Tim Chung, an American who is now living in Thailand to help manage his family’s organic farm and fresh vegetable operations. 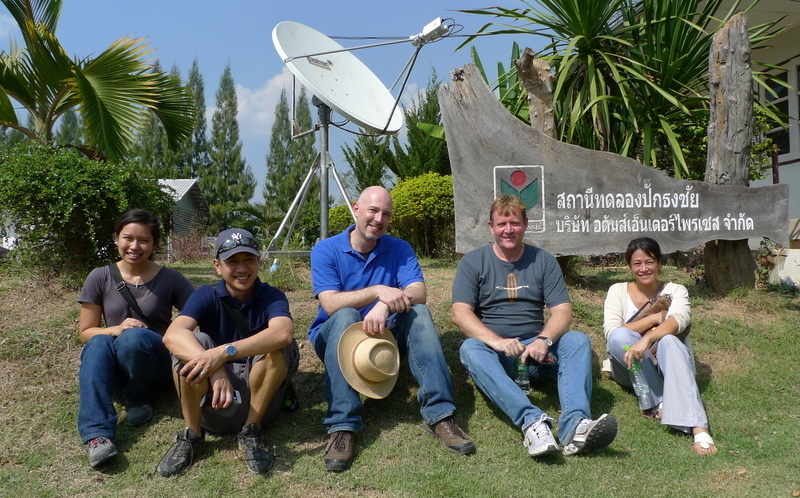 Tim extended an invitation to visit Adams Organic’s farm in Pak Thong Chai in Nakhon Ratchasima province – about a three-hour drive from Bangkok. This is one of Adams Organic’s two locations. 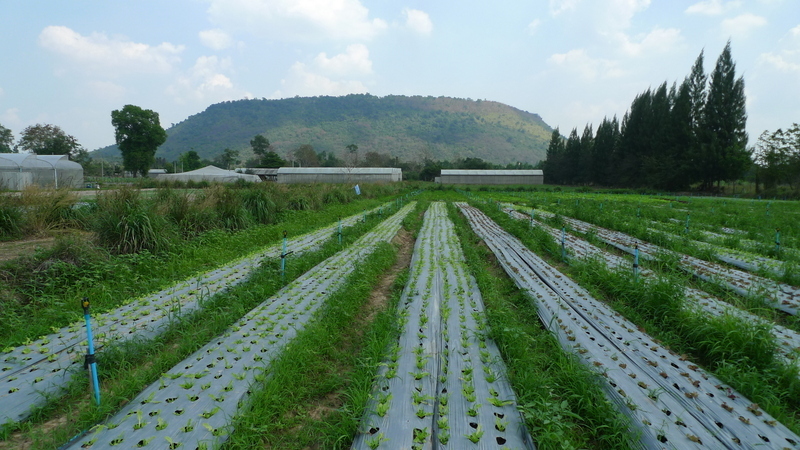 They also work with more than 20 organic rice farmers in Yasothon province in Thailand’s northeastern Isaan region, to grow organic vegetables in the dry and cool seasons. This works out well because rice does not grow efficiently during those seasons and vegetable production generally dips during the rainy season, which is prime rice-growing time. Adams Organic started in 2009 as an offshoot of a commercial organic seed producer, AEL, whose roots stretch back more than four decades. According to Tim, they saw a growing demand in Thailand for fresh organic produce so started experimenting with the idea. 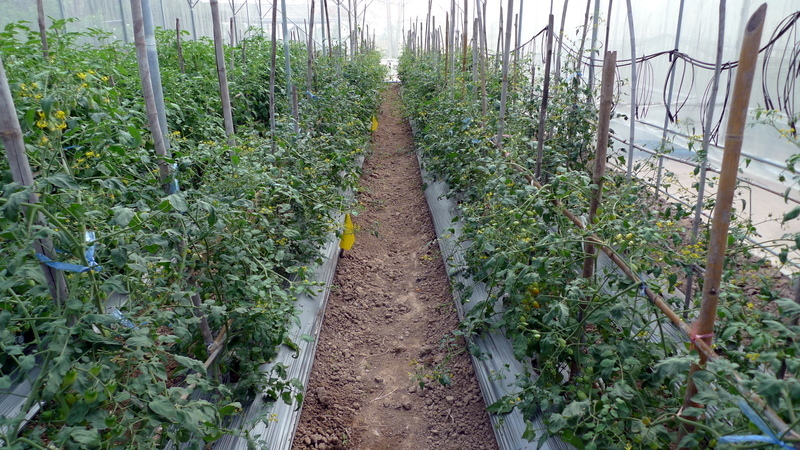 They now produce about six tons of vegetables each month for retail sale. The Pak Thong Chai farm is about 30 rai (or 12 acres). The farm grows a variety of organic vegetables, including tomatoes, zucchini, salad greens, melons, squash, cucumber, eggplant, garlic, and shallots. Some of these are grown in open fields and others are grown in net houses. Net houses are similar to green houses except the sheeting is permeable so its effect is more to keep the insects and other pests out than to regulate the temperature. 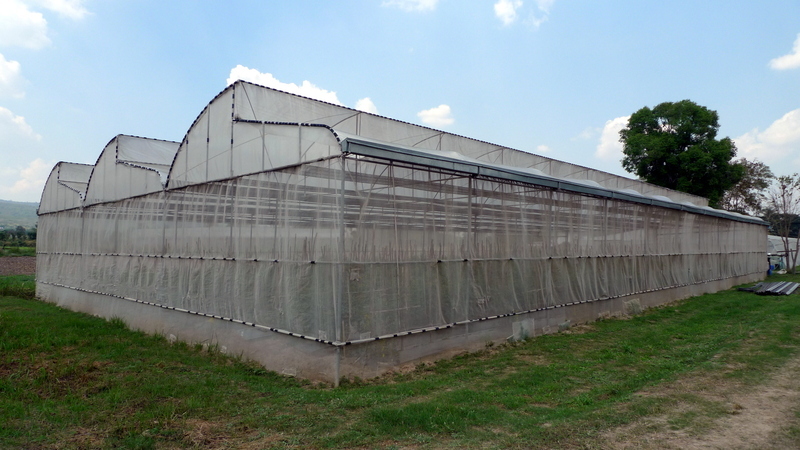 In addition, the very fine mesh of the netting provides protection from predators (including insects) that would eat crops and potentially carry unwanted diseases. Along with some additional dark sheeting, the nets provide a bit of relief from the strong sunlight and regular rain showers. To enter the net houses, you step in a box of ground limestone. This helps reduce the risk of soil-borne disease being brought in. There are also sprayers for hand sanitizer. 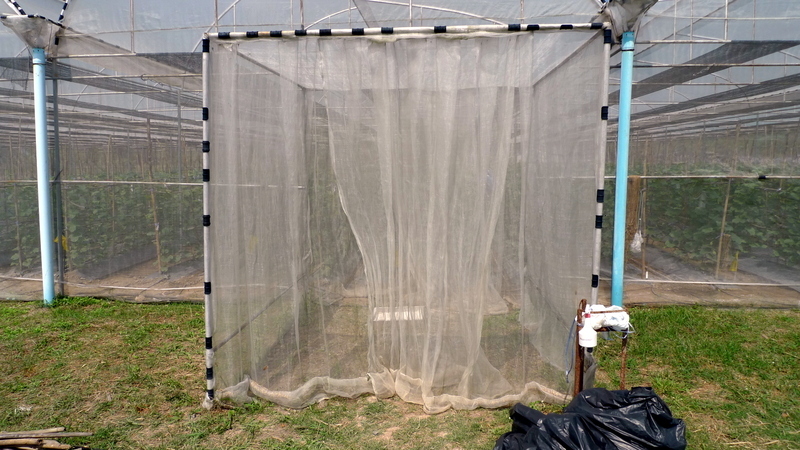 The two sets of double net curtains help restrict the entry of insects. 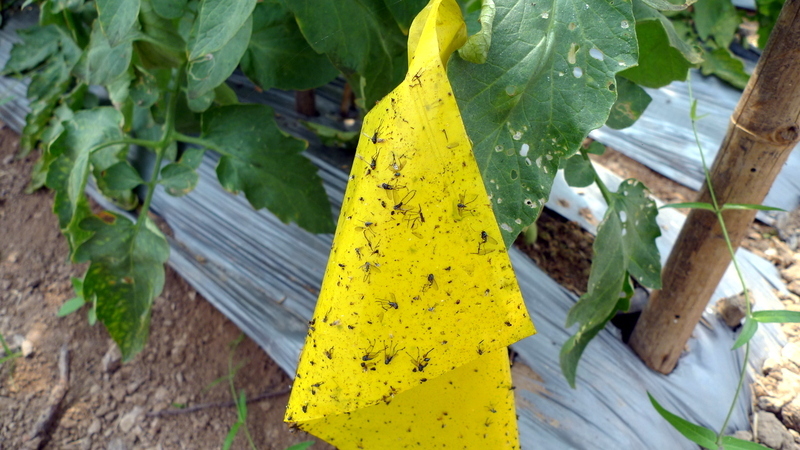 Another organic pest control methods is the placement of sticky yellow flags, which attract the insects and then trap them once they land. Additionally, inside the net houses you find plastic containers of sulfur powder. As the sun heats the sulfur, it gives off a gas that repels certain insects and also discourages the growth of microbes and fungus. Despite all those efforts – a testament to how abundant the ranks of insects are – there were still some insects inside the net house, but none that were causing a significant problem to the crops. An interesting side effect of these efforts to minimize insects is that pollination of the plants has to be done by hand. In addition to not using pesticides, growing organic also means that you cannot use herbicides. The farm has several techniques to minimize the number of weeds, which are harmful to the crops because they compete for water and nourishment. 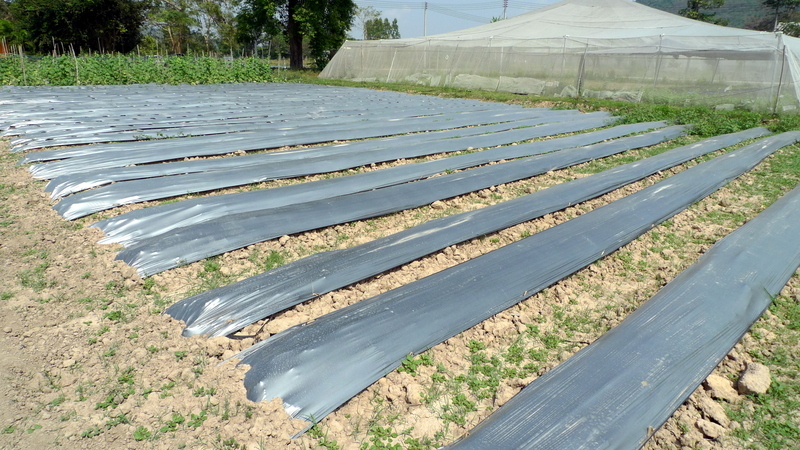 Before planting, the freshly plowed fields are covered with black plastic sheeting. 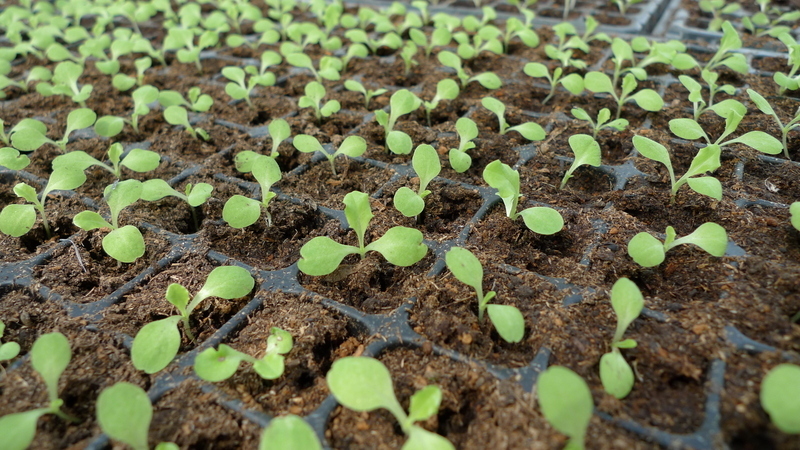 In colder climates this would be done to help warm the soil and wake it for a late winter or early spring planting. Here in Thailand, the black plastic super-heats the soil, killing off many of the seeds of other plants that may be in the soil already. 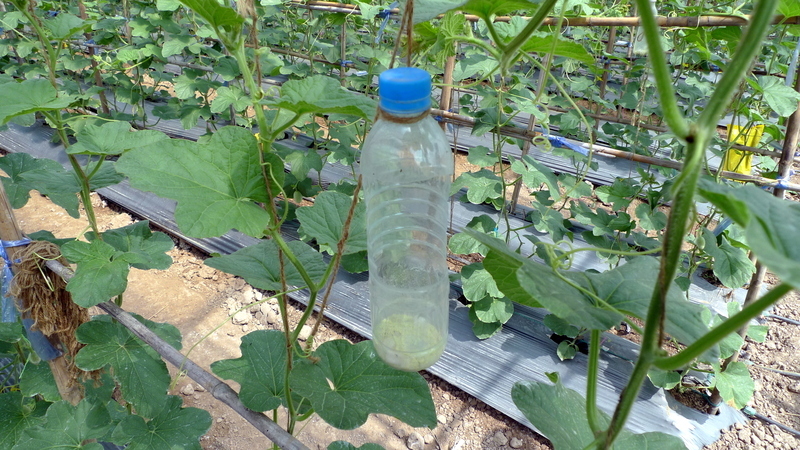 Seedlings of the desired crop are planted in holes cut into the plastic. As the crops grow, the plastic sheeting minimizes the number of competing weeds by cutting off any sunlight to them. Hand-weeding is also necessary while the crops are young. As the crops grow older, though, grasses and less-invasive weeds are allowed to grow side-by-side with the crops. 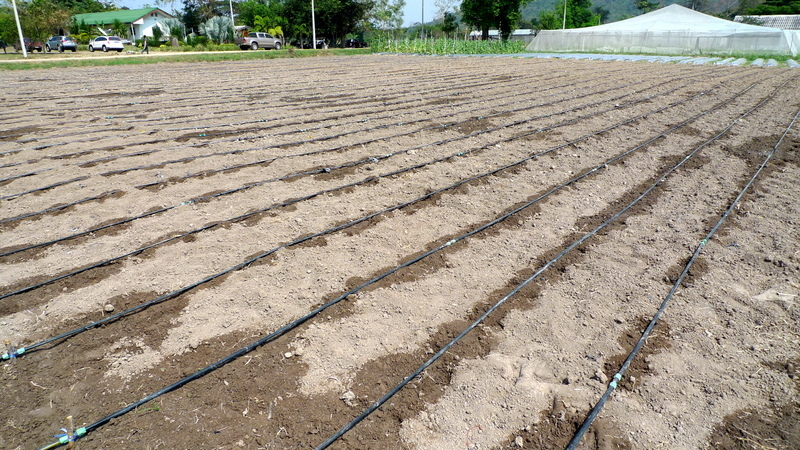 To conserve water, a drip irrigation system is used. This ensures that the plants receive a regular supply of water that is focused on the area immediately around the plant, reducing waste. As I learned during the visit, farming is a cyclical practice: the nutrients that you take from the ground must be replaced. In conventional farming, this is done with petroleum-based chemical fertilizers. With organic farming, the cycle is sustained in a variety of ways. For example, fields are planted in a rotating basis to ensure that soil quality is not diminished. For example, fields that grow tomatoes might then be plated with zucchini and then allowed to lie fallow before tomatoes are planted again. Different plants take and return different nutrients to the soil, one reason that the industrial agricultural practice of planting huge expanses with a single crop season after season, so called “mono-crops,” is so damaging. Additionally, the farm makes its own compost from trimmings and the remnants of plants after the fruits and vegetables are harvested. 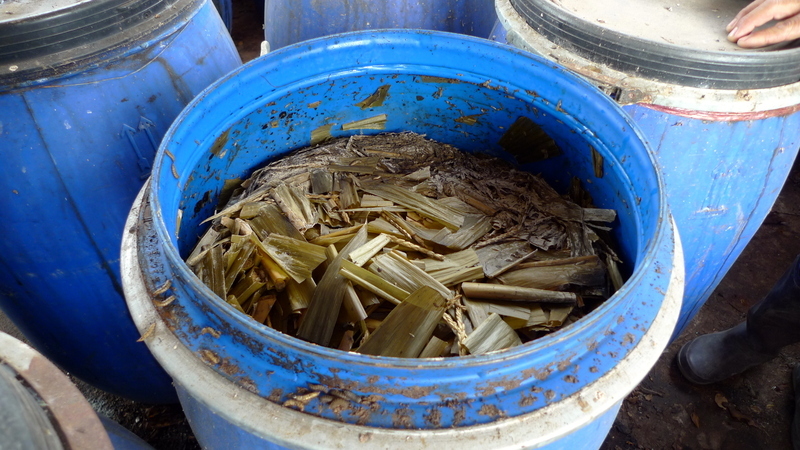 These trimmings are allowed to ferment and be biodegraded in plastic barrels before being worked back into the fields with organic steer manure. They are in the process of constructing a vermiculture – worm-based – composting system, too. One of the challenges when growing organic is keeping your fields from being contaminated from outside sources. To counter this, Adams Organic maintains an awareness of what is grown on neighboring farms and ensure that their fields are set back sufficiently from the property borders to maintain the organic quality of their produce. Our final stop on the tour was the packing house, a small warehouse that includes sanitary processing rooms and a chiller room. Produce is picked almost every day and the workers inspect, trim, and package the vegetables. 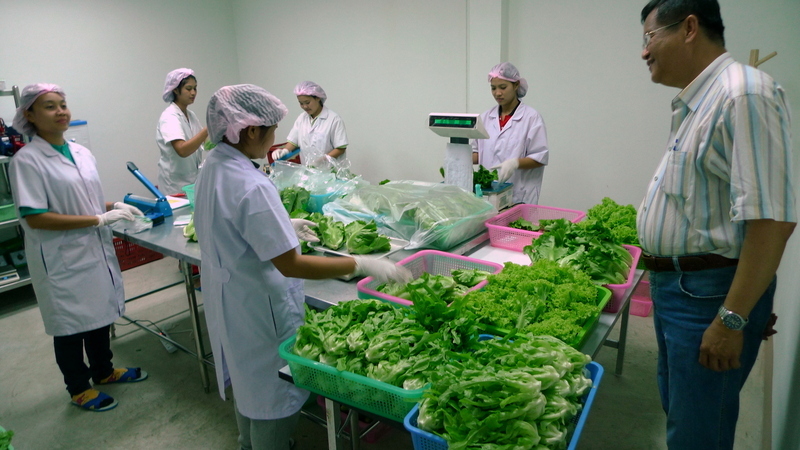 The packaged vegetables are then stored in the chiller room before being delivered three times a week to Bangkok-area stores by refrigerated truck. Their produce is available at ten locations of Tops supermarkets, several Foodland locations, and four Gourmet Marketplace locations (associated with the Mall Group). They also have a retail storefront on Soi Saladaeng and they are working towards a CSA or Community Supported Agriculture program where you pay a subscription rate and receive weekly deliveries of the freshest produce. 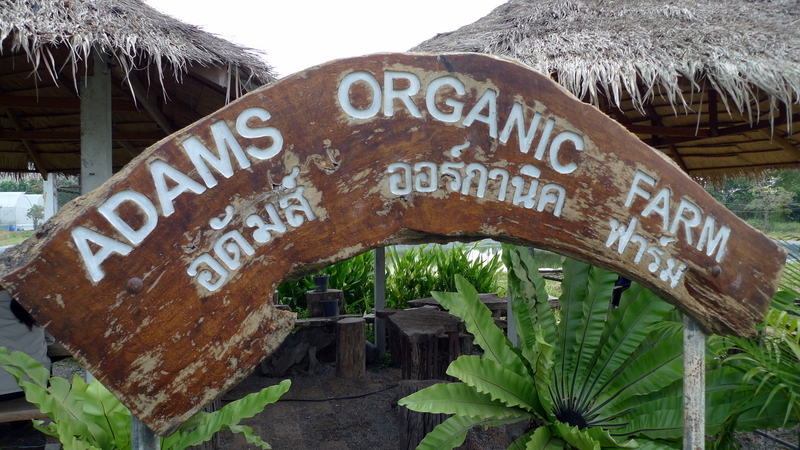 One of my big questions about organic food in Thailand is the extent to which it is reliably organic. On our trip, we were joined by a US FDA (Food and Drug Administration) certified inspector. Adams Organic is regularly inspected not only by US-licensed inspectors, but also inspectors for the European Union, Japan, and Korea. The inspections occur not because their food is currently exported (all of it is sold within Thailand) but because their original and primary business is growing organic seeds, which are exported for sale. Tim explained that it is difficult to give a general statement about organic providers in Thailand. The only way to be completely certain is to have your own chemical test kit and test different brands to see for yourself. Of course, that isn’t practicable. Most organic brands use a variety of farmers to provide their produce. The key, he explained, is to have good quality control to ensure all the products are grown by farmers who strictly follow organic practices. While the market for organics is expanding, the retail price for organics is relatively low compared to Singapore and Hong Kong. This is good news for Thai consumers but creates a challenge for organic farmers. 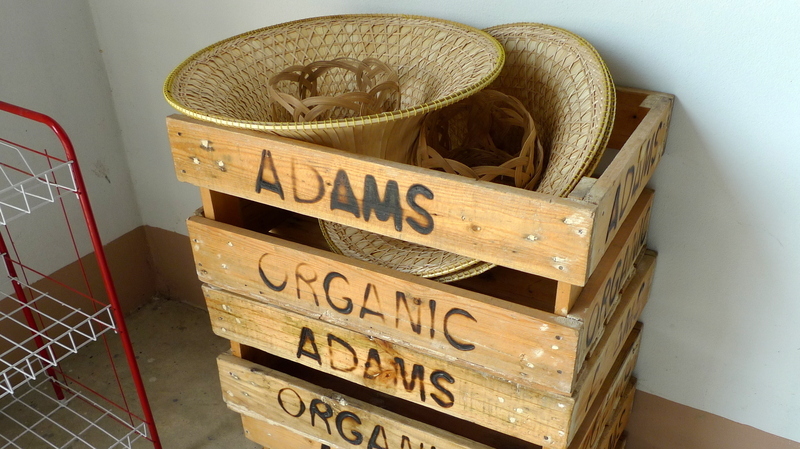 The retail operation is not yet profitable for Adams Organic, but they see this as a long-term project. Proper positioning now will give them the opportunity to develop the market and build a sustainable, profitable business in sustainable, healthy produce. Many thanks to Tim and the folks at Adams Organic for letting me take a behind-the-scenes look and share it with you. From left to right: Flerida, Tim, me, Ken, and Chow. This entry was posted in Uncategorized and tagged Adams, Agriculture, Farm, Farming, food, Korat, Organic, PakThongChai, Produce, Thailand, Vegetables by christao408. Bookmark the permalink. An interesting field trip, Chris! It almost feels like a step back in time. Thanks for sharing! I, too, thank you for showing us the many techniques they use. Interesting video. What is organic steer manure? Isn’t all manure organic? Interesting. I read the entire post. Yes, thanks for sharing the techniques. Lot of work for healthy food. Thanks for sharing this. I look out more for regional rather than organic because the term “organic” often leaves room for interpretation as you also pointed out. By going after regional produce I hope to contribute at least to less transportation. Back home I always wondered why we had to have apples from Argentina when we grow apples in Styria. And sometimes the apples from Argentina were as expensive or slightly cheaper than the ones produced locally. That always made me wonder. Your tour made the operation seem well run, and tended to with care. Lovely setting. With organic and locally grown, at least we have a better chance of eating food that is good for us. i feel like i’m on a field trip back in school hahaha. it was very educational and interesting, though! crop rotation is very important, but i just thought of something. i plant herbs in my container garden, and some of them are perennial so i don’t replant them or move them around. i guess that eventually will deplete the soil, especially in a container… any suggestions for how to get around that problem, or do i have to pull up my perennials and move them every year? Impressive operation! I’ve never fully understood the differences in the terms… Thaks for taking us along on the tour! That sounds like a really fun and educational visit! Very appropriate post for earth day. :)I found your comment about the regulation of the word “organic” interesting. I heard an urban myth about a grocery store in Toronto that said a worker at the store was spraying the organic vegetables to keep bugs away. I often wonder how organic our organic food really is…? This is a great post Chris. But unless I buy my produce from people I know in the farmer’s market, I don’t buy from the large chain grocery stores. So many times I have read that the ‘organic’ produce are fake and labeled wrong. I would rather grow my own. I just did a weeding job with a lady who was Obsessive compulsive. Sometimes the organic part loses to asthetics.I am glad someone had the time to more fully explain the process of growing foods organically and have shown some of the problems of trying to be organic.I am sure maybe someone will borrow the ideas that you have presented.————————————–As a side note the weedkiller Roundup is losing its effectiveness. The weeds are becoming immune to this herbicide and the new Roundup that is coming out will contain some of the same stuff as “Agent Orange” the powerful weed/plant killer that causes birth defects later in humans. Oh, I’m glad to see they are finally selling organic produce now. How about fruits? The veggies look so fresh, they’ll make a good medly of salad dish! organic produce is getting more popularity in indonesia too since about a decade ago, but the popularity is growing slow and the price range for such product is just too steep for the majority of the population to enjoy. an education on the understanding of what constitutes “organic” also greatly needed around here, as most have not a clue. let’s hope we get to a point in life where ALL fresh produce will be typically organic and anything less will be frown upon. @Inciteful - Thanks for the recommendation; I tried to be very cognizant of the article’s length, editing wherever possible. @LostSock21 - That depends on what the steer eats (organic versus conventional food) and whether it is treated with hormones or not. Strictly organic manure would have only organic inputs and no hormones. @beowulf222 - That’s a good point, Nick. There is definitely a problem with organic farming sometimes being done in a monocrop sort of way and also with organic items (as well as conventional ones) being transported thousands of miles for sale, undoing some of the benefits achieved by growing organic. You have to balance all of these consideration when trying to calculate the impact of the foods you choose. 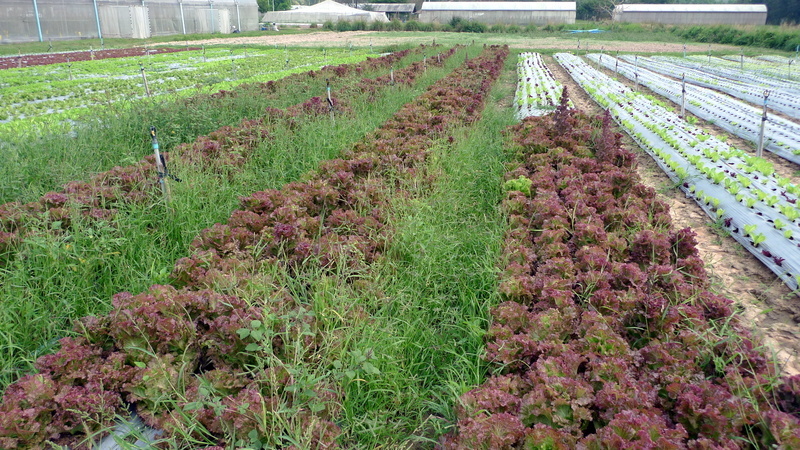 @CurryPuffy - The trip to the farm definitely whetted my appetite for a big, green salad. @PPhilip - Thanks for your comments. We’re seeing the same thing with Roundup as we are with the overuse of antibiotics – eventually, pests develop resistence and the chemicals/drugs lose their effectiveness. @ZSA_MD - @brooklyn2028 - Generally, I have a pretty high level of trust in the US FDA’s (and their Canadian counterpart’s) oversight, even though they are not perfect. In the US and Canada, if something says “organic,” it seems reasonably certain that it is. Although, as Nick pointed out in his comments, there are other factors such as how locally a product is grown, that should be taken into consideration when assessing the impact of what we buy. @kunhuo42 - Have a compost pile and work in the compost each season! @an_OM_aly - While I didn’t spend hours and hours investigating each aspect of their operation, their willingness to open their doors to me and my camera gives me confidence that the folks at Adams Organic are sincere in their commitment to organic, sustainable produce. @slmret - @nov_way - @Fatcat723 - @agmhkg - @armnatmom - @murisopsis - I’m glad you found the tour interesting. Thanks for your comments. I’m always conflicted between buying something locally grown and organic veggies or fruits that are imported. They are typically more expensive but if there is something locally grown and organic, I will give it a try. Do you know where you can buy Adam’s organic seeds in Thailand?